A new player in the WCWCatholic Chapel Challenge! Jeff Gardner stumbled upon the website www.prairieskyline.com, established for the preservation of important community buildings of Crookston, MN. 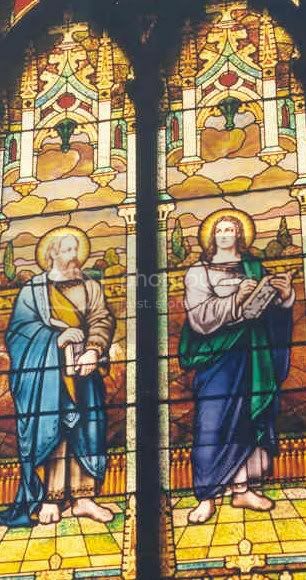 The site included many pictures of the stained glass windows from the former Cathedral of the Immaculate Conception in that town. Some of the windows looked very familiar! I contacted site administrator, Kay Hegge, who was kind enough to send us copies of the pictures and give permission for them to be printed on this site. 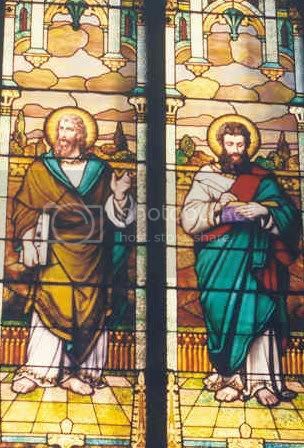 Compare the apostle on the left (above) with Chapel Challenge apostle number 4, whom we previously named Jude (below). Noticing anything in the top, but not the bottom picture? The spear is missing. Gardner says the spear is usually associated with Matthew or Thomas. This window might really mess up many of our ideas about who is who. Your thoughts are welcome. Let's assume for now that this is Jude, as suggested in our 9/09 update for now. 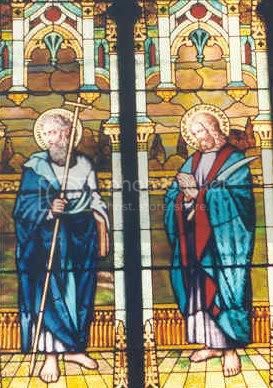 Compare the apostle on the right (above) with number 9 (below). Same face, expression, book, pose, but holding flowers in the picture above. You can see the same apostle as in the top picture in Jeff Gardner's gallery. This is obviously the same person, however the window of Gardner's didn't identify him either. He is shown with someone with a thin cross like Phillip would have. So we are calling this apostle James the Lesser for three reasons. First, he looks young here as the name "the Lesser" would seem to imply. 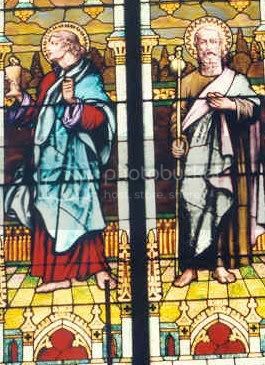 Two, because Phillip and James the Lesser share a feast day (May 3) which might make it logical for them to share a window. And third because there aren't too many unidentified apostle names left to choose from. Not too scientific. Your theories are welcome. Do these guys look familiar? These windows are from the Crookston cathedral (and were unnamed there as well). Compare the apostle on the right to the Chapel Challenge apostle number 2 shown below. Same body position, same hair, but no flaying knife. Bartholomew is the apostle who was flayed before he was killed so it is pretty certain that apostle number 2 is Bartholomew. Now compare the apostle on the left (above) to Chapel Challenge apostle number 1. Same book, same stick, similar hair. What is missing? The apostle at the top of the page has a thin cross at the top of his pole. Among the apostles, the thin cross like this is used to identify Phillip. You can see different pictures of Philip from Jeff Gardner's collection here. one of which would be Simon the Zealot and one would be James the Greater. Gardner has a picture of James the Greater pointing to a book so I will call the picture on the right, St. James the Greater. That leaves us with Simon the Zealot on the left. Here are some more interesting windows from Kay Hegge's Crookston cathedral collection. The one on the right is another version of our St. John (number 7) window. 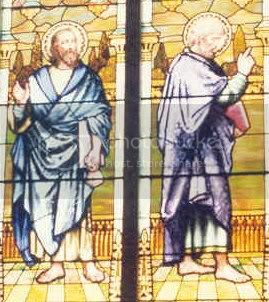 The person on the left looks like he would be at home in our Chapel Challenge apostles collection but he doesn't resemble any of our windows. I wonder who he is. Maybe a gospel writer. And who are these gentlemen? The Crookston version of our Thomas (number 3) is on the right. The man on the left is unknown. Here is the Crookston version of our Andrew and Peter (numbers 11 and 6). This style is very similar but the faces are done differently. The former Cathedral of the Immaculate Conception, located on Ash Street in Crookston, MN is of national significance according to www.prairieskyline.com. It is "the most magnificent one of the last three new-gothic churches with three towers." Still quoting from the website, "These three churches are only in Northern Minnesota. The three-spired churches were the product of one dedicated man, Bishop Timothy Corbett and his dream of a Northern Minnesota French Canadian Catholic mecca for the service to Native Americans, fur traders and Catholic settlers. The Cathedral is the most magnificent of the three with its three towers topped with spires and gilded crosses that catch the light and sparkle the town throughout the day. The other, in Duluth is used as a performing and visual arts center, and the third, St. Anthony's Catholic Church, stands vacant in Terrebonne, Minnesota." The site continues, "Built of red pressed brick, it was awarded a place on the National Register of Historic Places in 1998. The 1912 construction has extremely unusual antiphonal balconies built for alternating choir responses, on both the north and south sides of the Cathedral. Combined with the huge choir/organ loft balcony in the rear of the church, the Cathedral seated 1000 people, making it one of the largest Cathedrals in the nation. Burt D. Keck, designed this Cathedral and its sister church in Duluth, Minnesota, not only for its gothic beauty, but also for amazing musical acoustics. Built to serve the new Diocese of Crookston, it served the people of the oxcart fur trading days, steamboat trade and settlers that homesteaded here when James J. Hill built the railroad in 1878." The website explains the current condition of the cathedral, which has been vacant since 1990. "The former Cathedral was a victim of a two Catholic paradigm shifts: The trend to simplify ornate Catholic churches in the sixties led to painting over the hand painted angels in the ceiling and changing altars and lighting. The communion rail was removed in the seventies and in 1990, the Diocese built a new Cathedral of modern box style. The Diocese transferred ownership of the empty Cathedral to a nearby homeless shelter who desired the rectory for more shelter space. 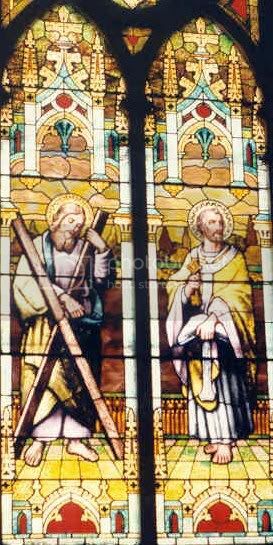 The stained glass windows were either given to Cathedral parish families as requested or were removed and sold to support the homeless shelter." So in summary, these windows are no longer in the cathedral but have been shipped off to various places. And if you would like to make a donation towards the restoration of this amazing, but quickly deteriorating building, Kay Hegge would love to talk to you, khegge@gmail.com. Thanks to Jeff Gardner and Kay Hegge for their help with this page. Share your thoughts, opinions or research with us at wcwcatholic@gmail.com.